The prayer expresses the profound love that God has for us in that He makes known to us the mystery of His divine being. God the Father sends the Son to reveal to the world his love, his very self, and in this love offers life. Today’s Gospel passage reminds us of the intimate relationship between Father, Son and Spirit. Jesus says, “Everything that the Father has is mine,” and “[The Spirit] will take from what is mine and declare it to you.” Through the Spirit he invites us to the fullness of life in the bond of love between the Father and the Son and the Holy Spirit. Divine Wisdom is one way by which the Spirit of the Lord is referred. In the passage Wisdom takes delight in human beings. Humanity is raised above all creation in that it delights God. In other words, God is pleased by human beings. The concept is also reflected in the first creation account in Genesis when after describing the creation of man God finds it “very good.” Again mankind is placed above all other creation. The relationship established through creation is taken to a whole new plane through the Son of God becoming man and redeeming him. The love of God fills our being through the presence of the Holy Spirit. The Spirit dwelling in our souls binds us to God and each other in the unity of peace. 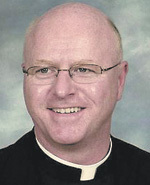 Msgr Joseph Prior is pastor of St. John the Evangelist Parish, Morrisville.